Presenting at 5 and 6 PM, The Preservation Jazz Masters with Leroy Jones. Presenting at 8, 9, and 10 PM, The Preservation All Stars with Charlie Gabriel. Born in 1958, trumpeter Leroy Jones was raised in New Orleans’s Seventh Ward. He started playing cornet at St. Leo the Great Elementary School and soon got a trumpet. When he was twelve, his neighbor Danny Barker heard him practicing and recruited him for the Fairview Baptist Church Band, which Jones later led. 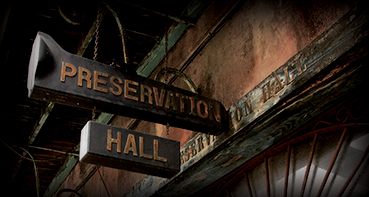 Sometimes after finishing Fairview gigs in the French Quarter, Jones and his bandmates would stop by Preservation Hall to listen. Jones went on to play with Harry Connick Jr. and His Orchestra and become a member of the New Orleans Jazz Hall of Fame. Trumpeter and composer Terence Blanchard remembers growing up around Jones: “He was the guy that was well ahead of his time. He played with a command and maturity that is still unmatched. When I listened to him play I always imagined myself having that tone, or his sense of phrasing, and definitely his sense of rhythm. He was and still is my hero.” These days, when he’s not on tour, Jones leads his own band at the Hall each week, delighting audiences with his impeccable technique, modern swing, and warm, gentle voice. He is married to Hall trombonist Katja Toivola. Clarinetist, saxophonist, and flutist Charlie Gabriel is a fourth-generation jazz musician from New Orleans. Raised in a classically trained musical family that emigrated from Santo Domingo in the 1850s, Gabriel began playing clarinet professionally with the Eureka Jazz Band when he was eleven years old. During World War II, his father, clarinetist and drummer Martin Manuel “Manny” Gabriel often sent his son as a substitute on gigs. Charlie recalls how the musicians with whom he played —T-Boy Remy, Kid Humphrey, Kid Sheik, Kid Shots, Kid Clayton, and Kid Howard— also raised him and brought him home after the gigs.